Are you getting tired of kimonos? One more post. At the end of November is Seven-Five-Three Day. This is a blessing ceremony for children ages 7,5, and 3. Three year old and seven year old girls will get dressed up in kimono. For boys the age is five years old. Most families will have professional photographs taken and then go to a shrine for a blessing ceremony or at least to pray at the altar. The day Tetsu and I were in Ashikaga, we walked through the shrine grounds and came across lots and lots of families bringing their children. So the following pictures are of little girls all formally dressed up for the special day. This is a different type of kimono from what I showed yesterday. These are fancily embroidered. The shrine was beautiful with the ginkgo trees all golden. We noticed that the father in this family was a foreigner. It is difficult to maneuver those steps in all the finery. Is this little girl happy to be the center of attention? The leaves really made the shrine grounds sparkle! The maple trees were not to be outdone. The parents were having trouble getting these cute twins to smile at the same time. The one little girl is too absorbed in the ginkgo leaf! I remember doing all this with Leiya. 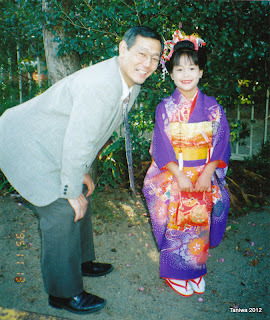 We didn't visit the shrine but we did all the dress up and hair styling. It was very pricey to do too! But I am very glad we splurged on that special day. Tetsu's pride and joy. Both have sure changed in 17 years, haven't they?